If a Brooker has C in its name it means it has either a side or centre console. The Brooker 510C I reviewed was the more common centre console. Statistically, a 5.1 metre boat is very close to the current average length of leisure boat. 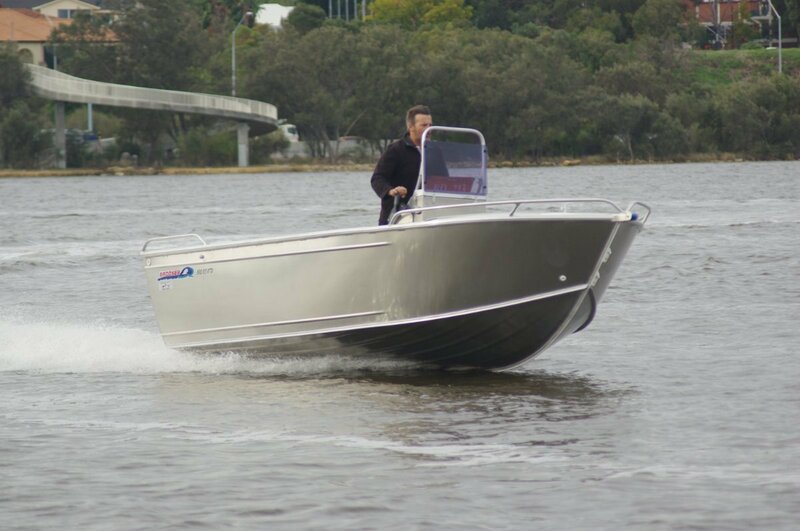 Looking at the picture of a small, naked aluminium boat with no top cover can give a false impression; this is actually what most people buy, what they can afford. It makes a neat fishing package. The naked aluminium has something to do with the affordability. A couple of thousand or so saved by deleting the paint is significant stuff, as well as removing the worry of scratching the finish and shattering the resale value. The metal, with no bog or paint to disguise anything, reveals a fair surface and tidy welds. Permissible power for the 510 is 100hp, which strikes me as more than most owners would ever use. Our 80hp Honda four-stroke did the trick for us and was even a few horsepower more than many owners would choose. On the other hand a few extra horses in reserve is never a bad thing. 80hp was good for 33 knots which is a lot more speed than would be much used on the ocean, but allows for activities such as skiing. At rest the rear ends of the chines dip under water giving good stability. At the first throttle movement they are on top of the water and the Brooker is planing. This is an extremely manoeuvrable boat; rounding up on pots would be a breeze as would parking alongside. The windscreen is lowerable. This ability can park the Brooker under a low carport but, perhaps more importantly, it lowers towing drag. A not widely known physical law is that if you double your speed you quadruple your air drag. An immutable law that encourages anything you can do to reduce that friction. It is a tough screen with an equally tough frame around it to give standing passengers a handhold. There is permanent seating for three on upholstered seat boxes aft and forward of the console so standing will seldom be necessary. These boxes supply the storage volume that is often in short supply on centre consoles, but without interfering with fishing room. More stowage is available in short side pockets and on two levels within the console. The Brooker has the usefully high sides internally of 0.61 metres. A handful of centimetres makes a big difference to the feeling of security or otherwise when moving around a small vessel; or when keeping an eye on children. Like a bow rider, a centre console allows you to put the children forward, permanently under the driver’s eye. The splash well is only partial height, a sacrifice to allow the motor room to tilt. This is an improvement on many boats of this size and type that simply delete the well. At the other end the anchor well, sensibly in plastic, is mounted in a foredeck ahead of a neatly curved coaming. Anchoring facilities are basic but effective: a simple bowsprit and a cruciform bollard. Everything else you could reasonably expect for an asking price of $35,950 is present and correct: carpeted deck, navigation lights, rudimentary boarding platform, rod holders and so on. If the price is a bit rich for the budget a smaller Honda or a Tohatsu two-stroke (the world’s number one two-stroke) will shave of some thousands.